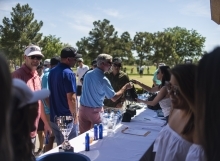 On May 7th, Hakkasan Group hosted its Second Annual Charity Golf Invitational at the Spanish Trails Golf Course. 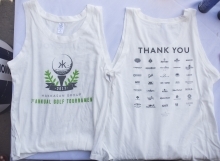 As an extension of the renowned hospitality group’s Hakkasan Gives Back initiatives, the company partnered with the Keep Memory Alive Organization supporting the mission of Cleveland Clinic Lou Ruvo Center for Brain Health and raised nearly $90,000 for the local organization between sponsor donations, tournament entries, and silent auction items. 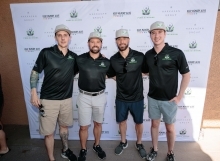 Kicking off at 9:30 a.m., over 200 guests headed to the destination for a day filled with golf and fun, all to benefit a truly important cause. 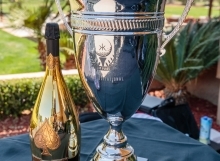 Around 10:30 a.m. Joe Haro, Executive Director of Corporate Partnerships of Hakkasan Group and Rich Kenny, Executive Director of VIP Marketing and Customer Development of Hakkasan Group, joined Keep Memory Alive Co-Founder and Chairman Larry Ruvo and Kevin McCracken, Senior Vice President, Spirits – Southern Glazer’s Wine & Spirits on the green to present them with a commemorative check with the initial donation of $75,000 for the organization. 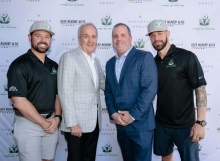 On May 22nd 2017, Hakkasan Group donated a $50,000 check for Keep Memory Alive at our first ever Charity Golf Tournament at the Spanish Trails Golf Course. 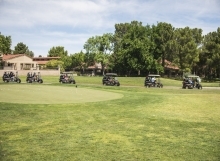 Over 200 guests headed to the destination for a day filled with golf and fun, all to benefit a truly important cause. 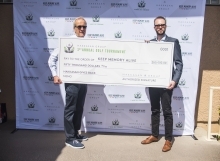 Nick McCabe, CEO of Hakkasan Group, joined Keep Memory Alive Co-Founder and Chairman Larry Ruvo to present him with a commemorative check for the organization. – Anna Robins, Senior Director at Keep Memory Alive. 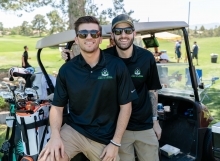 To learn more about Keep Memory Alive, visit their website.